October in Canada - Scandinave Spa — Always Packed for Adventure! Spending a cold, snowy day outside in a wet bathing suit might not sound ideal, but it's exactly how i spent my Saturday afternoon in Whistler. Being a Southern California native, i start complaining about cold weather the minute it dips down in the 70's. In fact, i have the heater blasting in my home right now, because we are having dreary overcast day outside. Thus proving the power of suggestion! i would never in a million years have thought that i would be okay wearing a bathing suit in the snow, but the lure of spending an afternoon in a day spa is a powerful motivator. We decided that we had to experience the Scandinave Spa after seeing a brochure in our hotel lobby. The host at the Crystal lodge lit up with excitement as she described her favorite place in town. We were sold. The Scandinave Spa is located just outside of the main village in Whistler and nestled in the woods. Just next to the parking lot is a beautiful path through the woods to the front entrance. This picture was taken on the way out. i am all bundled up, but utterly relaxed. it's also a bike trail! 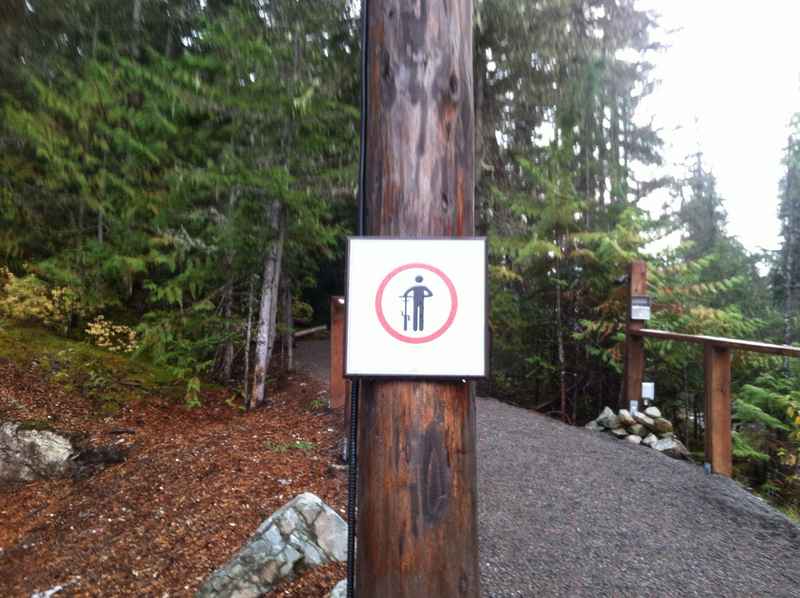 Seriously, it seems like everyone on the west coast of Canada is fit. The main lobby to the spa is filled with comfy chairs, couches and warm fireplaces. Everyone is wearing robes and sipping little cups of lemon water. The Scandinave has a very strict quiet policy and the main lobby with adjacent cafe are the only places where you are allowed to chat. They actually have monitors walking the premises to enforce the quiet policy. i loved it, as you can actually hear nature as you are sitting in it! A luxury for this city girl. We didn't plan ahead and get treatment appointments, we just showed up for the basic package, which includes use of the facilities for $58.00. We also added on a robe rental for $12.00. I only saw a few people with their own robes, pretty much everyone rents them. We were given two towels and a locker key. The women's changing area was big, with large lockers to hold bulky winter jackets and bags. i kept one towel in the locker as recommended by the staff and used it at the end of the day for my shower. The locker room has several showers with shampoo, conditioner and soap and a vanity area with lotion and hairdryers. We quickly changed into our swim suits with our robes as coverups. The first steps into the outdoor area, both of us barefoot, was piercingly cold. We skip/ran over to the Eucalyptus steam room to get inside fast. i did not have my camera with me and i would imagine that taking pictures of people relaxing in their bathing suits would have been frowned upon. Here is the link to the spa's websites with some great pictures of the grounds. The spa has a suggested three step routine for maximum health benefits. The first step is warming up the body. This can be achieved by spending about fifteen minutes in the Eucalyptus steam room, the Finnish sauna or one of two hot tubs. The second step is a quick cool off in cold water. There was one ice cold pool and several outdoor showers. The last step is a break in an environment to bring your body back to it's normal temperature. in addition to sitting in the main lobby, the spa has two solariums lounges to bring the body back to regulation. Although it might be too cold in the winter, the grounds are filled with outdoor seating areas, such as hammocks and chairs around a fire pit. One of the first things that we discovered, is that everything gets wet fast. Our towels and robe were wet within the first treatment. it's just something that you get used to quickly, as there is no way to stop it and everyone else is in the same boat. i would recommend bringing an extra robe and extra towels. The towels and robes from the spa are very thin and not very absorbent. Even though it was snowing, the spa was packed. This meant that sometimes certain facilities were too crowded or that it was hard to find a hook to hang your robe and towels. i would suggest arriving when they first open, not in the middle of the afternoon. The hot treatments warmed my body so much, that i found it was not a problem to be outside in a wet bathing suit. Once we went into our first steam room, i never felt cold. If anything, i felt too warm most of the time. The cold pools and showers didn't even feel freezing once my body was super heated. We spent about three hours at the spa and midway through our experience, we went inside the cafe for a snack. They don't have a lot of variety, but the cheese and fruit plate that we got was absolutely awesome. We nibbled and had hot tea while watching the snow flurries fall into the steaming spas. it is impossible to not feel relaxed while sitting in a spa in the middle of nature. One of my favorite things were the solariums, two rooms filled with lounge chairs, new age music and enormous windows facing the woods. i couldn't decide if i wanted to take a nap or watch the birds in the pine trees. Serene. The Scandinave Spa is a must do when visiting Whistler.